I could wear these boots all the time. Seriously. Even though they make my feet look abnormally small. I just love them! 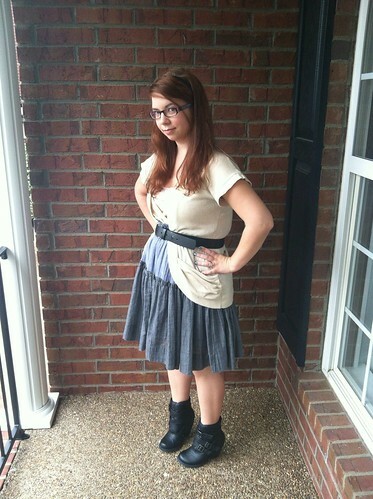 This is also probably my most favorite of all my Modcloth dresses. I bought it last year in the 70% off biannual sale- it’s my favorite time to shop on Modcloth. I initially bought it on a whim, but it turns out it flatters me a lot better than I thought it would. Plus it’s incredibly comfortable. I wore this for a weird school day- there wasn’t a 7th period today, so I spent most of the day in the library working on the cast list for the fall show. I had forty kids audition and felt so bad that I couldn’t cast all of them! But there were only fifteen speaking parts, so…well, hopefully no one will come to me crying or angry on Tuesday. After work I went to my friend Rachel’s house for an impromptu girl’s night. We had pasta with fresh veggies from her garden (I made the olive oil/fresh basil/fresh garlic sauce) and she made the best lemon poppyseed scones I’ve ever had. And we watched Newsies, which is seriously the best movie ever. All in all, the best way to start a three-day weekend!